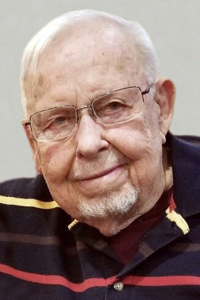 CEDAR RAPIDS — Kenneth M. Brekke, 90, of Cedar Rapids, died Sunday March 17, 2019 at the Dennis & Donna Oldorf Hospice House of Mercy. A celebration of life will be held Saturday May 4th from two to five in the afternoon at Cedar Memorial Park Funeral Home. Survivors include his wife of 68 years, Joan Brekke, his children; Jeri (Mitch) Travis of Marion, Iowa, Janet Brekke of Cedar Rapids, Iowa and Carol (Chuck) Eichem of Plainfield, Illinois, ten grandchildren and two great-children. He was preceded in death by his parents, his brother, Eugene Brekke and his sister, Vivian Ferguson. Ken was born on February 9, 1929 in Britt, Iowa, the son of Anton and Julia (Jorgenson) Brekke. He married Joan Marie Brekke on August 25, 1950 in Webster City, Iowa. Ken was a police officer in Webster City before starting his college career at the University of Iowa and eventually obtaining his Master’s Degree in the Biological Sciences from Central Michigan University. He was a Science Teacher for the Cedar Rapids, School System from 1962 until his retirement in 1992. He served in the National Guard from 1947 until 1956. Ken enjoyed camping, fishing, scuba diving, building historical ship replicas and eating every kind of pie. He loved to pilot his Cessna 172 and enjoyed spending summers aboard their cabin cruiser on Lake Michigan. Please leave a message for the family on our web page www.cedarmemorial.com under obituaries. Memorials may be directed to The Dennis and Donna Oldorf Hospice House of Mercy or Unbridled Spirits Thoroughbred Retirement Ranch of Lisbon, Iowa.